With today's tubeless tires, actual blowouts are rare, but may still occur. When tires do fail, the most common cause is improper tire pressure — usually pressure that's too low. Checking the overall condition and pressure levels of your tires frequently can go a long way toward ensuring you'll never experience a blowout. Ease off the throttle and slow down gradually. Do not use the brakes . Braking, especially braking hard, will only make keeping control of your motorcycle even more difficult. If you must use some brake, apply gradual force to the brake on the good tire and ease your motorcycle to a safe stop. Caution: Using the brake on the wheel with the bad tire can cause the tire to separate from the rim, resulting in immediate loss of control. Be aware, however, that integrated braking systems don't permit “rear-brake-only” applications, while linked braking systems do not allow for single-brake operation. On motorcycles with either of these two systems, braking with the “good tire only” may not be possible. Any braking necessary should be done very lightly and with great care. Avoid downshifting too. Like braking, this will only make your bike less stable. Firmly hold on to the handlebars while keeping your arms bent. Do not “fight” the steering to correct the wobble or weave that will likely develop. Focus instead on maintaining control by keeping your motorcycle directed in as straight a line as possible until it comes to a stop. Remain seated until your motorcycle has come to a full stop. 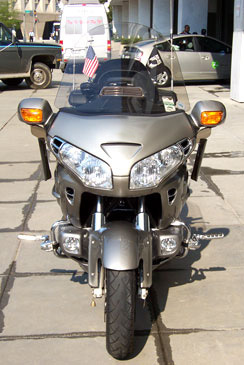 Once stopped, push your motorcycle as far away from the travel lanes as possible.